AFA supports legislation, HB1505, introduced by the Mississippi legislature which allows for a religious exemption to the compulsory childhood vaccination schedule. 47 other states offer an exemption. As Christians, we share the deeply held religious belief that the Bible teaches that parents are solely responsible for raising their children, not the government (Deut. 6:4-9). However, when it comes to vaccinating children, the State of Mississippi places the power of governing authorities over and above this parental responsibility. Child vaccination should be a choice that's left up to parents to decide and not be dictated from the government. Contact and urge your MS Representative to vote for HB 1505 to allow religious exemption for vaccinations. House legislators will be voting on this bill today and early next week. Your email to them is critical because of a deadline for the bill to come out of committee is next Tuesday. 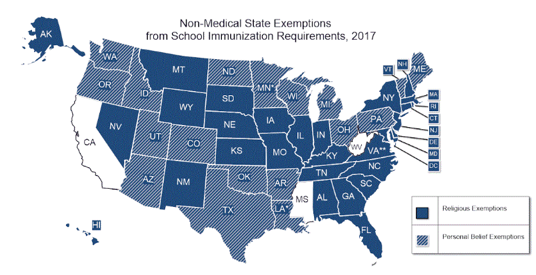 Parents in 47 other states have the freedom to decide what vaccinations their child should or should not have, but Mississippi stands with California and West Virginia as the only three states offering no exemptions for vaccinations. Mississippi's current vaccination laws violate two significant religious principles held by our organizations, our supporters, and a vast number of people in our state. The first is religious liberty, and the second is the sanctity of human life. People of faith have a constitutional right to freely exercise their religious beliefs and not be compelled by the state government to violate their beliefs. Also, many vaccines for children are based on cultures from aborted babies. According to the U.S. Center for Disease Control (CDC), a significant number of vaccines contain byproducts of aborted babies. People of faith who oppose abortion should not have their children subject to a government forced vaccination. Again, contact and urge your Mississippi Representative to support HB1505 to allow for a religious exemption to the compulsory childhood vaccination schedule.